Audrey at Putting Me Together is hosting a 7×7 remix challenge! 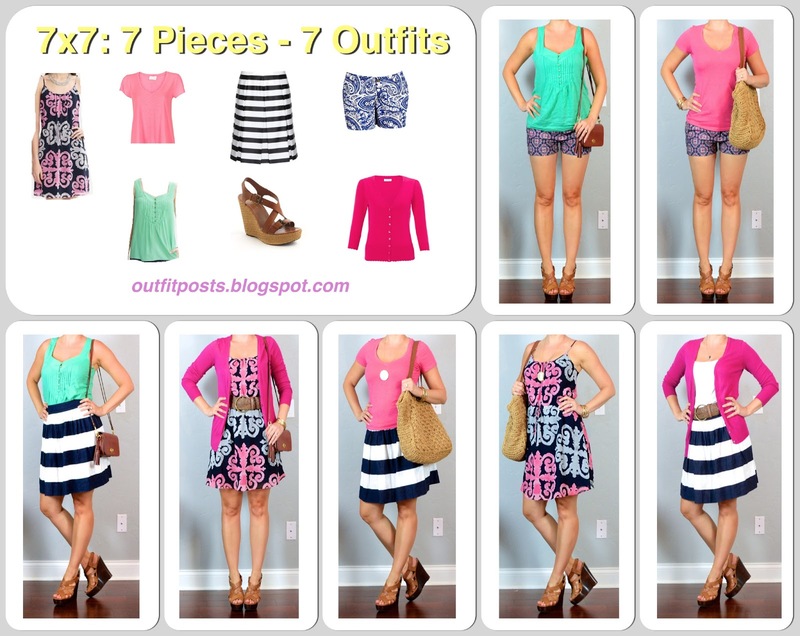 The idea of the challenge is to show 7 outfits created from 7 pieces (including shoes – but I didn’t count my white cami) to help you to stretch your ideas for different & new ways to wear a small number of items. I love the idea! I selected the pieces of clothing that I’ve been wearing the most lately for the remix. (Some are new – you can see my shopping list of stuff I’ve bought recently here.) So far this summer I’m basically living in this striped skirt and the medallion dress. Love love love. Hope you enjoy! outfit post: 7 pieces, 10 outfits – summer! Oh my goodness, I love your remix! So many fun colors! Thank you so much for participating. Love your outfits! I did the 7×7 challenge as well and went with pink and green tops! LOVE that you got a dress in there too! Diggin your paisley shorts too- super cute! I would wear every one of your outfit! I love this color palette, gorgeous. Thanks for linking up and participating with us! So cute! Obsessed with that striped skirt! Love your 7×7. You're a pro at these!!!! Stop by and check out my 7×7. You did such a great job on your 7×7! I think my favorite outfit is the mint top and the striped skirt. 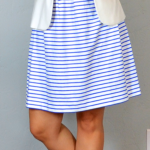 I can see why you're living in the striped skirt all summer – it's so cute! I love that dress and the striped skirt! You inspired me to buy some tan wedges so thank you! Great as usual, Mary Kate! I like that you have a fair amount of patterns and were able to work them in. But of course–you're a pro! Very cute! I love that skirt. 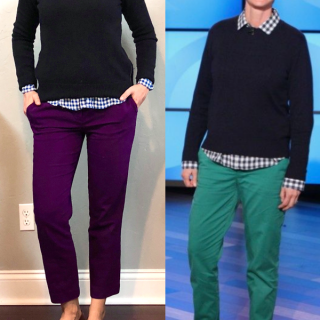 I love all of your outfits! They are all so bright and vibrant. I will definitely keep that in mind for the summer… and the next challenge! Not that you asked but I like the sideways-is hopes better than the straight on. Something looks forced about the straight onpose. Anyway, keep up the cute mixes! Grrr autocorrect. Sideways pose. Not sideways is hopes! I love the main colors you chose for this…mint, navy, and pink are fab! Well done! Love the colours you chose! And those shoes are great! Great remix!! That striped skirt is so much fun! I love the shoes that you picked and that dress is so cute!! Love the outfit you ended up with! Nice! Wow! You did a great job on the 7×7. I love all of these looks…so cute!! so awesome. I love looking at your posts like this to help for packing. Haha I have a problem with packing everything I own when I go somewhere. It has gotten better since I started traveling more but your posts are just awesome! I have a pair of wedges like that where you can wear them with everything. I think everyone should invest in a pair! I love mine to death. They go with everything in the summer! Dang it! I KNEW I should have purchased the blue and white skirt from Banana! I bought the tan. I'm so boring! Tan just means you can wear more fun colored tops!